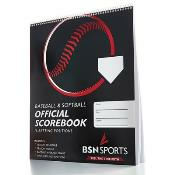 Baseball/Softball score sheets..each book scores 26 games. Each book scores 26 games with 18 batting positions and 9 innings per sheet. Also includes team roster, season schedule, season totals, batting average chart, pitcher stats and simplified scoring instructions. Pages measure 9 1/2" x 11".